You are Here: UniPay Gateway > FAQ > What is a payment gateway? Is UniPay gateway a payment gateway? The meaning of the term payment gateway changes based on context, but it is most commonly used to designate a server-side piece of middleware that facilitates communication between a merchant and a credit card association such as Visa or MasterCard. Generally speaking, when a card is swiped at POS or when an on-line purchase is made, a payment transaction needs to be passed to the card issuer to be processed. Payment gateway is the piece of software that makes this transmission process possible. In today’s world, the term payment gateway is often used in contrast to processing platform to designate a more modern technology, often wrapped around a legacy system, to provide additional features to the integrators as well as to simplify the integration complexity usually associated with legacy processing platforms’ communication. Among many of its features, UniPay gateway does include all of the traditional payment gateway capabilities. It is designed to be processor agnostic, which means that any merchant sending transactions to UniPay gateway can reach different processing end-points (processors, card issuers or banks) in a unified, seamless way. Your payment gateway questions answered by our team. 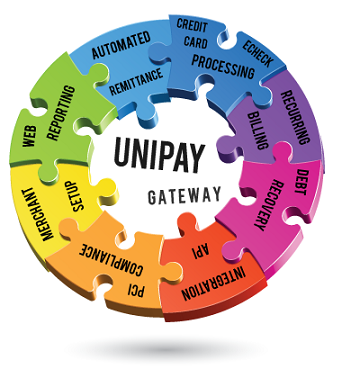 Answer to a commonly asked question whether UniPay Gateway is a payment gateway. How does UniPay gateway fit in the definitions of payment gateway?